It's the season of coughs and sniffles, isn't it? I've been having fun with some new images from the Saturday Evening Post line to make some pick-me up projects. Masculine get well cards are even more difficult that average, I reckon - flowers are an easy fall back for feminine ones but the blokes are a bit more tricky. I think this would work though! 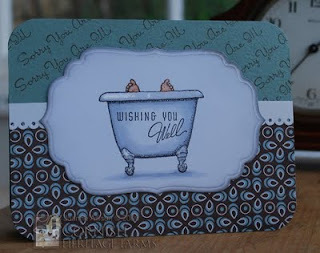 I was so pleased to find the sentiment fits perfectly on the end of the bath tub and I stamped the "Sorry you are ill" phrase to make a pattern on the paper at the top. A small scale Basic Grey pattern that's slightly reminiscent of old-fashioned tiling and a little Glossy Accents on the tub's feet and rim and you're done! Then I thought it would be fun to try using the same image for something other than a get-well project. 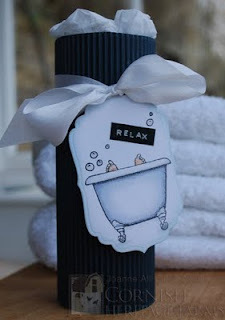 This would make a great way to present a spa treatment token or dress up a little bottle of bath bubbles or massage oil. I used an empty ribbon spool to make the base of the tube and stuck a strip of corrugated card (found at my local pound shop - any sturdy card would do) around it. Just tuck tissue in to finish off the top. The bubbles are doodled and have dots of Glossy Accents over them to make them shiny. Thanks for stopping by, hope you are not in need of a get-well wish yourself but take plenty if you are! Do you have some types of card that you always struggle with? For me, it's baby and wedding cards! I think the baby ones just got easier though - Baby Dear and Vintage Baby Expressions should help things along! I do like a bit of vintage so if I just forget the baby bit and focus on the vintage bit things should go along much easier! I went for a mono sepia look on this card, aiming for a sort of vintage photo look. The base layer and the border inside the cut out circle are coloured with a marker so this is a minimum supplies project - just white cardstock, a handful of markers, embossing folder, a couple of pearls and a die cut. I bought the blossom top box template from Everything Creative a few weeks back and finally got chance to play. I was so pleased to find that the ETA stamp from the Baby Dear set is an absolutely perfect fit! I alternated it with the stork from the Vintage Baby Expressions set around the six sides of the box and finished off with faux brads - they're just cardstock punched out with a Crop-a-Dile and coloured with the ink pad. Wouldn't this be a cute way to present a tiny gift to an expectant mum? 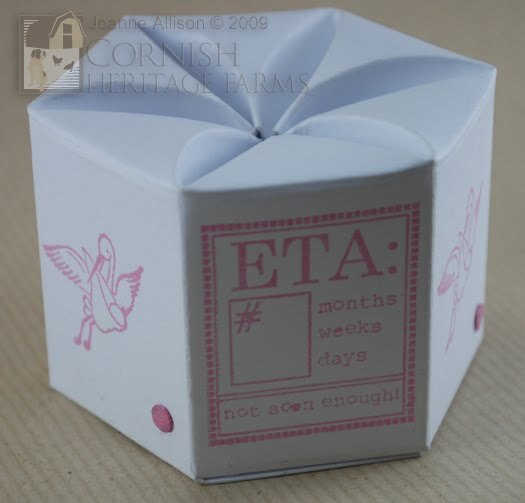 Any favour box would look great with the same treatment. The monthly challenge over on the Bubbly Scrumptious blog is to use the quote "A thing of beauty is a joy forever" on your project. I chose to make a simple card. I have a stamp that includes that quote plus an equally lovely one from Confucius so I reached for that and used this week's sketch from Card Positioning Systems to pull it together as a quick make. I used the out of the box technique for the butterfly and positioned it to pull your eye to the start of the quote around the circle (I hope!). 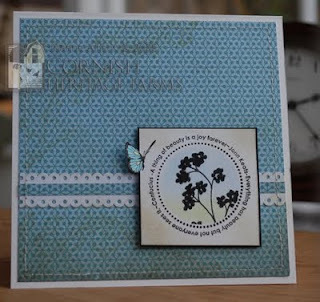 I used a hole punched with a Nestability die to mask the stamped circle and tinted with blue and green chalk and then stamped the silhouette flowers with the mask still in place. Thanks for stopping by - hope you find something of beauty in your day today! I've picked black, gold, ivory and red as my colours - we'll see how the proportions of each change over the weeks! I had a bit of a nightmare photographing this for some reason, I hope you get the idea! My triangle is about 4" across the top and 6" from the top to the tip of the point. 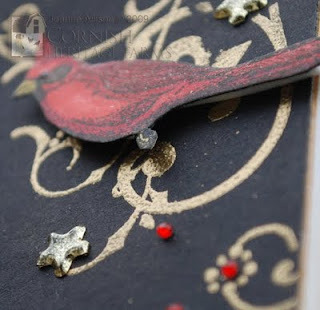 The cardinal is cut out and popped up on some foam tape and I added some tiny star brads to the embossed swirls - they came to me as part of a swap so I'm afraid I have no idea of the maker. I added some Spica glitter pen over the wing and crest of the cardinal for some subtle shimmer. I'm not sure how they'll join together yet so I haven't punched any holes or anything - the top edge looks a little plain to me at the moment but I'm hanging fire until I see how the whole thing shapes up before I add anything! 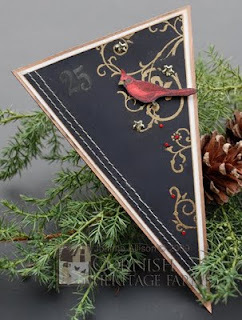 Today's challenge over at Daring Cardmakers is to use kraft cardstock on your project. I love kraft so this wasn't a difficult one for me! For those of you in the UK, I usually get the ribbed kraft recycled cardstock from PDA as I like the texture it has. I've made a little gift card holder rather than a standard card. It's basically the same as the pop up one I did a wee while ago (in this post - link to instructions for it there too) but I've changed the proportions and used a standard A4 sheet so the piece that holds the gift card is just a little shy of half way on the folded bit in the middle. It's Ready Steady Stamp time again and I didn't have any ingredient issues this time so I'm playing along (couldn't find my hessian last time - frustrating as I'd only used it a couple of days earlier!). Here are the ingredients for RSS8 - nice ones, I think! I've never done a skinny so that made a nice change. I went for totally simple treatment on that bit and thought it would be fun to make a fairly modern looking card with a vintage style stamp set so The Night Before Christmas got an airing (OK, I only managed the snowflake and sentiment but still!). I used silver metallic thread and did crazy machine stitched lines in the hope they'd look kind of like the drift lines if you're watching snow fall through a light source. Sorry the photo doesn't really pick up the metallic sparkle - it's like glitter really isn't it, you really need movement for the effect to show! 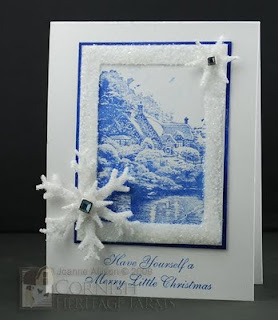 I added crackle by using Rock Candy paint on a die cut snowflake. It's very cool stuff but you do have to be patient, especially if you add a reasonably thick layer so you get bigger crackles. You can speed it up with a heat gun once it's started to crackle but that can seem like a long time coming! Impatient? Me? Great challenge girls - thanks! Thanks for stopping by today, I appreciate you taking the time! 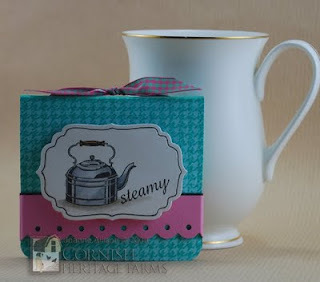 Tea bag holders make cute little gifts when you want something to give just as a "token". I used these instructions for my holder but turned it so that the ribbon is at the top. The kind of tea bags that come in their own sachets are best for this and they're bulky and light enough that the belly band holds it all together tightly enough that they won't slip out, even though they're pointing downwards. You can substitute anything you can think of for tea bags in these - how about a couple of After Eight mints or those little squares of Green and Blacks chocolate that often appear in the shops round about Christmas time? You can also make a small square message card and pop that into one of the pockets if you prefer not to write on the insert itself. If you go for heavier contents like chocolate, it's probably best to keep the "book spine" orientation though to make sure nothing falls out! Gosh, October has flown past, hasn't it? 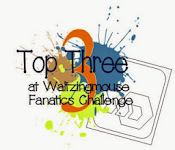 This is the last of the challenges for CHF's month of sponsoring the Gingersnap Creations blog. The challenge this week is a Random Redhead one of "Thankfulness". 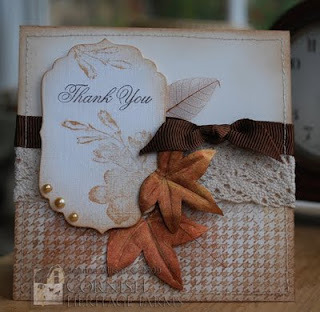 I decided to go for a straight "thank you" card to say thanks to the Gingersnap blog for making us so welcome as guest designers this month! I felt like doing something completely different in terms of my style when I sat down at my stamping table and this is what happened! Inspired by Jo Capper-Sandon's sprayed background in Craft Stamper mag a couple of months back, I made a sort of ethereal background piece by putting a few hedge clippings on white cardstock and spraying with Red Maple Glimmer Mist. 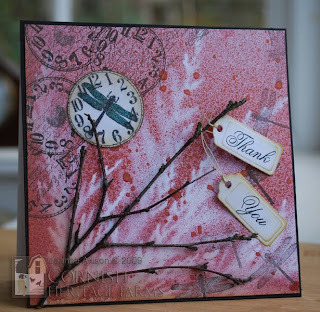 I overstamped with dragonflies, script text and clocks then added one cut out clock where the dragonfly wings are coloured with Spica glitter pens and the whole lot is coated with Rock Candy Crackle paint. We've been using natural materials in our Gingersnap projects this month and I think I could have claimed that the hedge trimmings were it but I decided to push it a bit further and found some birch twigs for a more dimensional effect (we have lots of birch trees and the wind we had at the weekend meant finding twigs on the ground was not difficult!). I've hung the tags directly on the twigs using linen thread. Thanks for stopping by today, I really appreciate your visits! 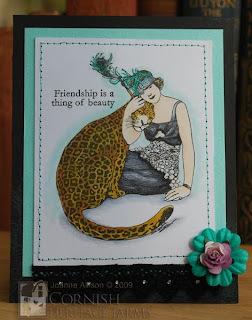 The challenge at Daring Cardmakers this week has been set by Kathy who wants us to pull out a few of our favourite things to make a card! I've avoided the Julie Andrews route though! So... you may have noticed I like to stamp :) I also love vintage images and my favourite colours are at the blue-green end of the spectrum. I like lace, especially if it's vintage or "rescued" from clothing etc and I often sew on my cards as I love the textural interest it brings. Teeny tiny gems intended for acrylic nail art tend to find their way onto my project when I want a bit of bling that's not too in your face. Add in colouring with Copics and adding subtle pattern to the card base (in this case with Perfect Pearls over a black base, just at the bottom of the card - you'll probably have to click through to the larger view to be able to see it) and I think I'm over Kathy's quota of at least five things. Just for good measure, I added something I don't often do but is a fave when I see it on other people's work (Kaz was the first person I was conscious of noticing it on) and that's the little tea rose threaded through the Prima. Thanks for visiting, hope I managed to include some of your favourites, too! It's the third challenge of the month during CHF's sponsorship of Gingersnap - that means it's time for a colour challenge! The colours this month were orange, green and brown. Sticking with the month's overarching theme of harvest and using natural materials, here's my card. It had to be pumpkins really, didn't it? 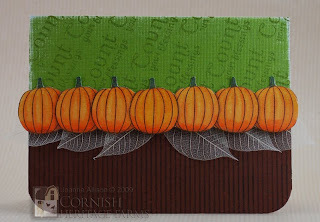 I stamped and masked a whole row to reduce the amount of cutting out (you only have to do the top and bottom edge this way rather than cutting round each and every pumpkin!). 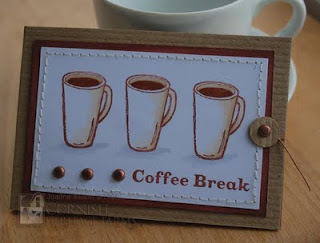 I used a sentiment stamp from the set to create a little interest on the green panel and the Fine Lines backgrounder on the brown because it makes me think of corduroy fabric which I think is very cosy and autumnal! 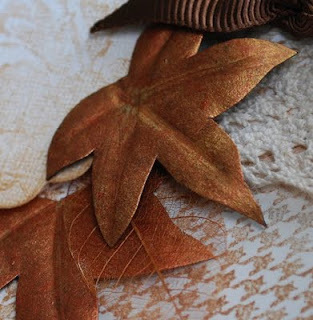 In a bid to break free from raffia and jute, my natural material this week is skeleton leaves. They do stick out from the edges of the card but they're delicate and filmy enough that it was hard to capture that on camera. Thanks for stopping by, hope you enjoyed the card! Eek, what's come over me? Not only is this glittery, it's pink and glittery! 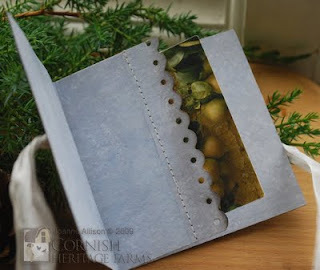 Over on the Cornish Heritage Farms Be Creative blog, the DT are doing regular step-by-step projects and I'm taking a turn this week. Evict the children and animals from your workspace and prepare to go glittery! 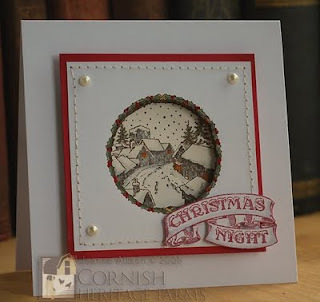 The full project is here and there's a chance to win a set of Christmas sentiment stamps too - check it out! It's Gingersnap challenge time again! The second challenge of the month is the "Spicy Supply" challenge and the supply this month is brads. I actually doubled up here and did the Clean and Simple challenge from Splitcoaststampers too (it's a technique challenge this week - thumping!). What's thumping? Well, basically you ink up your stamp and then "thump" a marker over the surface of it to introduce some random colour variation. (ETA: Use the side of the nib to thump so that you don't run the risk of damaging the tip.) 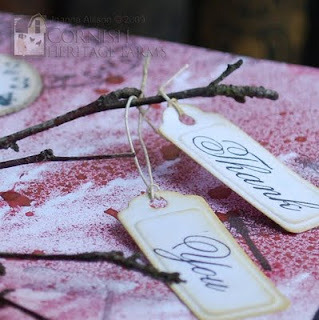 I used Caramel ink and a red marker for some autumnal tones in my branches. The brads provide corner accents for a stitched frame. The theme running the whole month of challenges at Gingersnap is harvest and the use of natural materials. I guess my harvest connection is a bit slim this week but my colours are right! I've used jute garden twine as my natural material - just a wee bit to tie the base of the branches and hold the sentiment tag. 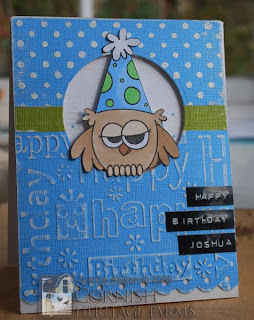 This is the card I made for my nephew's birthday - Happy Birthday Josh! For some reason, I just find kid's cards so difficult - in fact DH even suggested I could *gasp* pop down the shop and buy a card. Outrageous! I used Laura's Sketch 36 from the 2 Sketches 4 You blog to give me a kick start. I cut a hole for the circle and then raised the entire card front up on foam pads before sticking the owl over the aperture. I've personalised the design with some Dymo wording which also balances it out in terms of visual weight, I think. Sorry about the slight glare from the tape though - too much sunshine in Northumberland! I'm sure my nephew won't be too critical (he's not even at school yet ;o) - just hope his mum and dad like it! I needed to make a thank you card and a had a couple of things churning around in my head that got translated into this project! 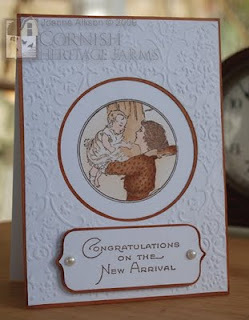 Hels posted a card made with a technique using spray starch and Perfect Pearls and the Tanda Teaser challenge this week was a colour combo - russet and gold. My first play with the starch was a bit feeble so I Googled and found a posting on a forum that made me think I should have just dumped the Perfect Pearls straight on the foamy starch rather than waiting for the bubbles to subside. Much better! Then rather than doing the embossing technique that inspired me in the first place, I decided to cut a couple of leaves as embellishments from my pearl covered piece. I used an embossing stylus to give them some "oomph" by making lines for veins on the front of the leaf and then flipping it over and using little circular motions to dome out the sections between the veins. 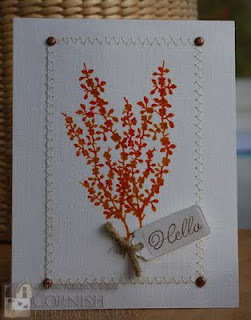 The final element churning around in my head was that I've been loving the way Julia Stainton uses this freesia stamp in a kind of "supporting role" way rather than necessarily making it the star of the show so the stamping on the sentiment panel was inspired by that. CHF have teamed up with Gingersnap Creations this month for an October full of challenges! For the full month we'll be throwing the spotlight on natural materials in our creations alongside the weekly themes. The first challenge of the month is always the Chestnut Theme challenge and this month's theme is, appropriately, harvest. I stamped the Saturday Evening Post Fall Harvest image and then coloured and cropped out just the lower portion of it (I dithered about this as I absolutely love the sweetcorn that's hanging at top right of the image but I had a landscape orientation fixed in my head for some reason so they had to go!). I used burlap ribbon and raffia as my natural materials - the burlap came from a Christmas wreath a couple of years back. I entrusted the job of buying one to DH and he came back with a very upscale affair with dried seed heads and walnuts and stuff in amongst the evergreens - a big burlap bow finished it off so I "salvaged" that as soon as the Christmas decorations came down! 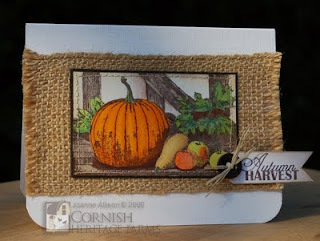 Gingersnap is a fun challenge blog with an emphasis on "no stress" and any kind of papercrafting goes so whether you're into cards, scrapbooking, altered art, inchies, ATCs, moos or whatever, why not play along and get into the harvest spirit? Thanks for dropping by today, hope you enjoyed the card! ...be happy! I found it impossible not to be singing in a Bobby McFerrin voice while working with this stamp set! Trying something different here - I don't usually do "scrappy" cards. This one took long enough that I remember why and I'm not entirely convinced about the outcome but I thought I'd share anyway! This is for Ready Steady Stamp Challenge 6 - I've been AWOL for a couple of challenges what with vacation and the enormous workpile that greeted me on my return but I was determined to get this one in before number seven goes up on Wednesday! I used a couple of Grungeboard swirls for my masks as I didn't have anything to hand that's actually designed as a mask and I was too lazy to cut anything by hand! The hearts are done with the rock n roll technique in two shades of pink (Salmon and Watermelon) and although the grey is minimal, it is there! (two shades of Copic on the B). 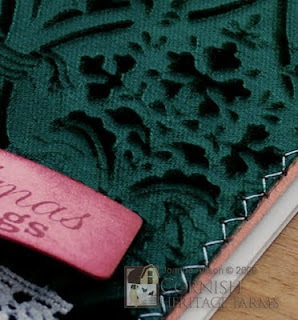 Isn't that crochet lace stamp lovely?! It was the reason I had to order this set and I think it looks really realistic embossed with white powder like this. I pulled my usual stunt with the bee - stamp the head and legs onto the heart, then stamp the whole bee on another piece of paper and cut him out without trying to cut round the legs and antennae. Line up the cut out with the stamped head/legs and you'll have a perfect bee without trying to cut round those fiddly bits! Thanks for stopping by, hope you enjoyed the visit! Happy World Card Making Day! I decided to go back to vintage for my final offering on the WCMD blog tour. If you're new to my blog, the last 12 days have all been holiday projects for the blog tour so feel free to stick around and browse for a while if you have a little time! I think this Santa is quite possibly my favourite Christmas stamp ever! He originally appeared on the cover of the Christmas edition of the Saturday Evening Post in 1923 and is the creation of the artist J C Leyendecker. I used a cropped version of the stamp in the card I posted last Friday but I thought I'd go the whole hog and make him the centre of attention here. 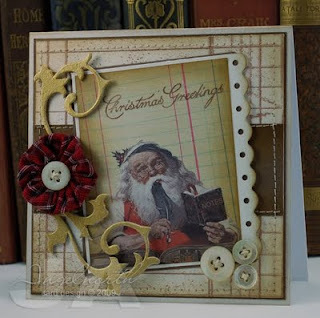 I used two stamps from the Primitive Christmas set here too - the sentiment and then the snow dots which I used to make a subtle pattern on the card base by stamping off first and then stamping the fainter impression with Vintage Photo ink. This is a larger format card (7" x 5") to really show off the image and I used Cryogen White for the subtle shimmer it gives. Copics work nicely on it too. Don't forget the coupon code if you're going shopping at the PaperCrafts/CK store - it's valid until October 12th. The link and code are in the side bar on the left if you'd like them. Thanks for stopping by today, hope you get some creative time too! I like to make at least one Christmas card design with a non-Christmas stamp set each year. 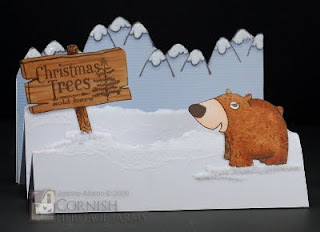 I've cheated just a little bit here by using one of the stamps from "Winter Vintage Signage" on my wooden sign but mostly this is elements from the Kim Hughes "Bear Hugs" set. I was so pleased to find that Christmas tree signage was a perfect fit on Kim's wooden board - score! I've used a stair step fold to fit today's Daring Cardmakers folding challenge and created a little wintery scene. I painted the tops of the mountains white first (with acrylic paint) and then added the ice glitter over the top. 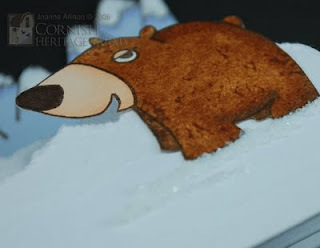 I've used glitter to make little crunchy drifts under the bear's feet and at the base of the sign, too. Just scribble a little clear-drying glue to make a pleasing snowy swirl and dump your glitter on top. I remembered Sherrie's technique for adding texture to an image coloured with Copics using blending solution and an old towelling cloth so I gave that a whirl here. I actually used isopropyl (rubbing) alcohol and it worked just fine. Hopefully you can see both the effect of that technique and the crunchy snowdrift in this detail shot. I left the bear's nose uncoloured until I'd done the texturing so he didn't end up with a blotchy nose! If you've arrived by way of the World Card Making Day blog tour I hope you've enjoyed an introduction to my blog. If you'd like the discount code and link to the PaperCrafts/CK store, they're over in the side bar at the left. Thanks for stopping by, I appreciate you taking the time! 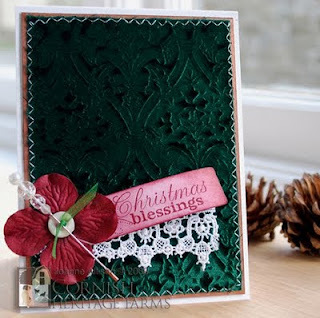 I've gone back to the Evergreen Holiday set for today's card but instead of using the cone as the focal image as I did last week (this post) I've used it to make a background paper by stamping off onto scrap and then randomly stamping the fainter impression onto Cryogen White cardstock (which has a lovely soft shimmer to it that's impossible to catch on camera - so pretty for Christmas cards!). I used a tiny dot of Glossy Accents to make the cardinal's eye raised and, well, glossy! 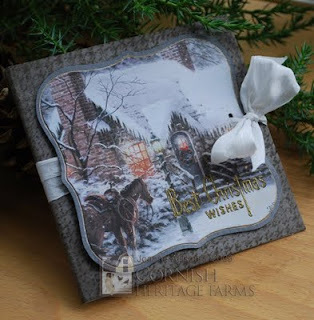 Thanks for the kind comments on the Kinkade gift card holder. I fed all the eligible names into Random.org (sorry teamie Jean, you have the papers already!) and asked it to shake up the list. 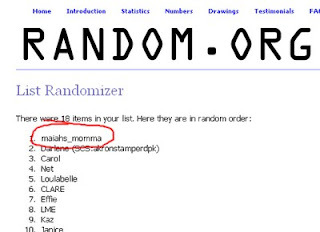 The name it gave me on top was maiahs_momma - congrats Catherine! I'll get your papers off to you ASAP. 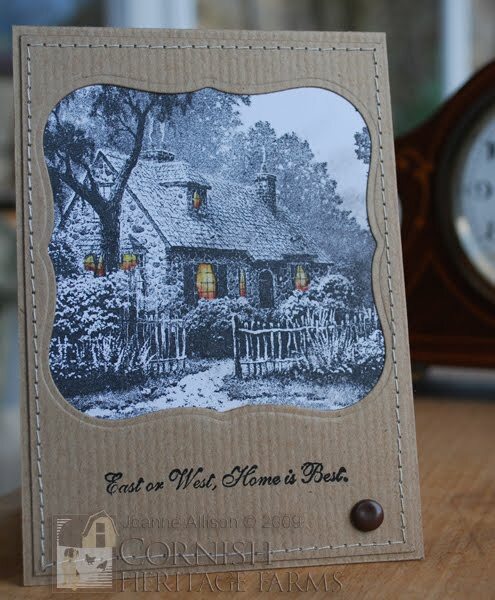 If you've arrived at my blog by way of the World Card Making Day blog tour - welcome! I hope you enjoy your visit. If you would like the coupon code and link to the PaperCrafts/CK store, they're over in the side bar on the left. Thanks for stopping by today everybody, I appreciate your visits! Don't you love it when a challenge on its own has you struggling but then something else comes along and you get an idea that combines them? DCM this week asked us to "tartan it up" and I couldn't think of anything tartan in my supplies. Then Lori set this week's Crafty Secrets challenge on Splitcoast to make fabric yo-yos (or other handmade fabric embellie) and it all fell in to place. I figured I might as well throw in a sketch challenge for good measure - lol! The card is based on Kazan's Sketch 36 over on 2 Sketches 4 You. 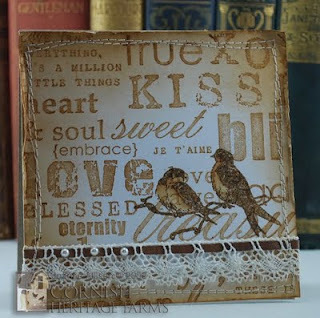 Unusually for me, the stamping takes a back seat but it's still there :o) This is one of those 5" square cards where you bless the fact you have a 6" square Scrapblock so you can stamp the whole background without piecing anything! I made the yo yo by cutting a circle with the largest Nestie from the Large Circles set. A tip if you are making these - use big stitches round the edge if you want your yo yo to pull up tight in the centre, small stitches will give you a more open one. If you arrived by way of the WCMD blog tour, please feel free to settle in and browse for a while if you have time - the last 10 days or so have all been holiday projects for the WCMD countdown. The PaperCrafts/CK store link and 25% discount coupon code are over in the side bar on the left if you fancy a spot of discounted shopping. Don't forget to leave a comment on Tuesday's post before midnight tonight if you'd like your name in the hat to win those Kinkade paper packs. Can you believe September is almost over? At CHF that means it's time for a new stamp of the month. 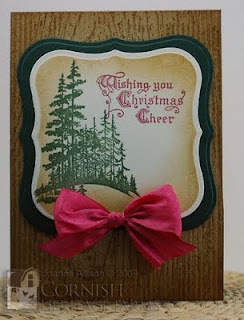 These pine trees are versatile enough to do all sorts of things but of course since I'm still trying to keep up with a holiday card each day during the WCMD blog tour, I've used it to make a Christmas card. Pairing up the trees with the woodgrain backgrounder lends a rustic kind of feel, I think. I didn't have any ribbon the right kind of colour so I used a Copic marker (Crimson) on a piece of plain white silk ribbon to get what I wanted. It matches the sentiment's ink colour much better in real life, the sheen of the silk has made it a bit pinker than it should be in the photograph, I'm afraid. If you've arrived by way of the WCMD blog tour then feel free make yourself right at home - leave comments, ask questions, whatever you fancy. The discount code for the PaperCrafts/CK store is over in the sidebar on the left if you would like to go shopping with 25% off your cart subtotal (stock up on some Christmas gifts, maybe?). I have something to give away tomorrow so drop back if you'd like your name in the virtual hat! Thanks for stopping by today, your visits are very much appreciated. I thought we'd take a move away from the more vintage and traditional feel of most of the cards I've done during the countdown to WCMD so far and have something with a bit more of a modern flavour! This is Sophie - she's a sweetie, isn't she? She's available as a single stamp or as part of the Heartwarmers set in the Kim Hughes Collection. I've teamed her up with a simple sentiment and a sparkly snowflake with some torn cardstock snowdrifts to keep her bottom suitably chilled! The snowflake is a die cut coated in Glossy Accents and covered in glitter. If you're new to my blog because of the WCMD blog tour then welcome! Feel free to leave comments, ask questions, grab a coffee and have a look at the last few postings for more Christmas card ideas if you have time to stick around for a while. The discount code for the PaperCrafts/CK store is over in the sidebar on the left if you would like to go shopping with 25% off your cart subtotal. Thanks for stopping by today, I appreciate you taking the time to see what I've been up to! This is a technique I love - it produces a rich and sumptuous effect with the right velvet (one with some synthetic fibre is better than a pure cotton one), perfect for a luxury, touchy-feely Christmas card! 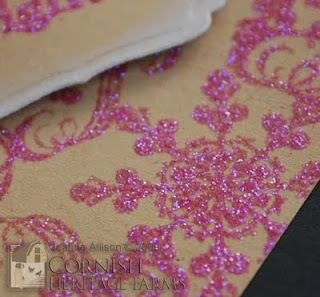 Embossing velvet is really easy – just mist your stamp with water, place the velvet pile side down on the stamp, mist the back of the fabric and then place your hot iron on top for 15-20 seconds. Don’t move the iron around or you’ll end up with a blurred impression – if your stamp area is bigger than your iron, just pick the iron up and place it down on the next spot rather than sliding like you would if you were ironing a shirt. A stamp with a reasonably bold design will give you the best embossed effect - tiny details will tend to get lost in very finely etched designs (so leave your Kinkades in the drawer if you reach for the velvet!). A deeply etched stamp is best. Here's a detail shot so you can see the texture even better. I've been asked if this technique harms your stamps. The answer is no! I'm not sure I'd try it with clear polymer stamps but natural rubber will take a lot of punishment before you do it any harm. The iron is never in direct contact with the surface of the stamp (if your fabric does not cover the entire stamp you can put a sheet of paper over before you place the iron on top). The only thing I've noticed is that the cling-mounted stamps will tend to feel a bit "floppy" just after you've done your embossing. Just as soon as it cools down to normal temperature, it's back to the normal rigidity. If you've arrived as part of the WCMD blog tour, please make yourself at home! The discount code for PaperCrafts/CK is in the sidebar to the left of my blog if you would like it. Oh, I finally caved and added the Followers widget to the sidebar on the left so if you use Google Reader it's now easy to follow my blog without having to know the technicalities of doing it for a blog without the widget! If you prefer not to have your profile pic on display on other people's blogs, just choose "private" rather than public when you become a follower. Thanks for joining me today, I hope you enjoyed the card! - Regulars to my blog will know I rarely work with patterned papers. I seem to have some kind of phobia and while I can spend ages admiring other people's work with them, I usually suffer brain freeze as soon as I pick one up, even if I'm only going to use it as a base layer. - I do vintage quite often but I rarely do retro/kitsch so I tried for a bit more that feel, even though the image is vintage (it's a Saturday Evening Post cover from 1923). - I almost never work from sketches. It's a bit like the DP problem - brain freeze! This is based on the CPS sketch this week. 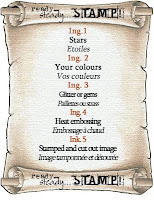 - I stamp partials quite often but I rarely think of actually cropping an image to a partial. 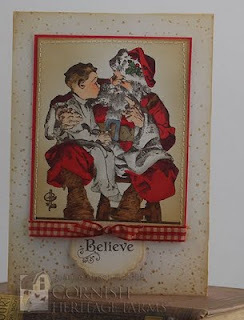 This Santa stamp is gorgeous in its entirety but I think it works this way too and it's a whole lot less colouring! What do you think - did I succeed in doing something just a bit different from my "norm"? 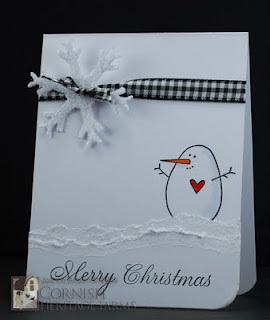 If you're new to my blog and arrived by way of the WCMD blog tour please feel free to make yourself at home and look around - the last few posts have all been holiday cards to celebrate the count down to WCMD and if you'd like the PaperCrafts/CK 25% discount code, it's over in the side bar to the left of my blog. This is created with the same stamp set I used for Monday's project but I haven't used any of the same stamps - gotta love a set that lets you create a variety of looks! I created a frame for this little scene by stamping the image once and cutting out the middle, then stamping again and colouring the scene. The holly frame is coloured on both pieces. I lined up the cut out frame and mounted on foam tape so there's some dimension going on. My DH actually commented on this card completely unprompted the other day which is unusual for him so I guess I must have done something right with it! 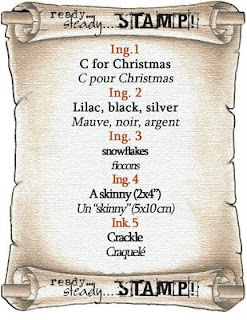 If you've dropped by as part of the blog tour and would like the discount coupon code for the PaperCrafts/CK store, it's in the side bar on the left of my blog and also in Monday's post of the other project with this stamp set. Thanks for stopping by today, hope you enjoyed the card! It's not everyone who would appreciate the effort you go to when you colour a Kinkade stamp. The easy solution to that is to skip the colouring! 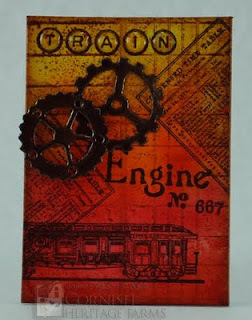 The detail makes these stamps a great choice to just stamp and go - you end up with a project that looks very involved but takes very little time. Intense blue and pristine white may not be traditional Christmas choices but I think they suit this stamp very well. Makes a change from the more vintage style of the last couple of projects, too! I choose Versafine ink when I'm doing a project like this as you get a beautifully detailed impression every time - you can click through for a better view. It's not always easy to get matching cardstock so to make a perfectly matching matting layer, I just rub the ink pad around the edge of a piece of white cardstock. any slight imperfections in coverage won't show when you have such a narrow margin on display. 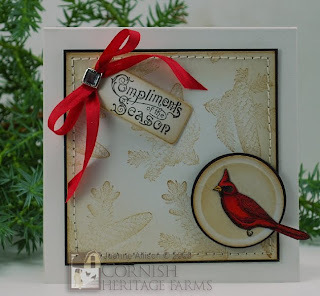 There's something new on the CHF Be Creative blog today - Kristine has done the first of our new weekly tutorials and she's giving away a Sara England stamp that just might help with your Christmas cards, too! 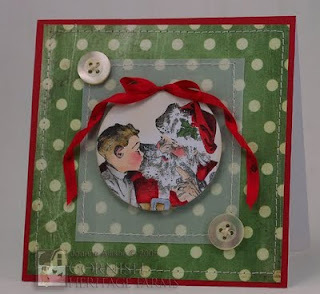 Check out the tutorial and the detail of how you might win the stamp here. 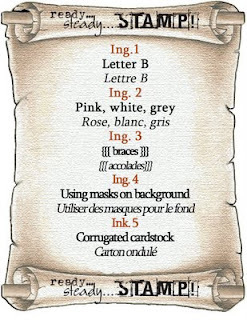 If you're dropping in on the World Card Making Day blog tour and would like the discount code for the PaperCrafts/CK scrapbooking store, it's 7YHZ-BMHR-NPTF. The coupon will be valid from midnight (MDT) on September 21 2009 through 23:59:59 (MDT) on 12 October 2009, and is good for 25% off your cart subtotal in the scrapbooking store.